Are you a fiction #audiobook fan? I asked that question in several places on Facebook this past week and was intrigued by the intensity of the replies! Many were not content to simply say yes or no but apparently felt a need to convince others they should embrace the same response. One thing many respondents agreed with? The narrator makes ALL the difference. There are excellent readers, there are good readers, and there are readers who should go into another line of work. I knew this. It’s why I’ve been delighted to partner with narrator and author Becky Doughty for my Farm Fresh Romance books. She has a great voice and has been a gem to work with. She’ll be wrapping up the series this fall with the last two books. I love that all six books are by the same narrator. It seemed important to me right from the beginning to have that continuity. But what about a new series? Becky is reserving 2017 for some personal projects, which is perfectly understandable. I was already debating finding a different narrator for new work — not because I’m unhappy with her, but because I wondered if a new voice for a new series might generally be a good idea. I asked some questions on Facebook because I was curious how readers /listeners felt about whether to proceed with additional titles in audio at all. Because the audiobook lovers are fanatical about audio — and because my audio sales have increased with each new audio release — I’ve decided to go ahead and invite auditions for Secrets of Sunbeams and hopefully the entire upcoming Urban Farm Fresh Romance series. Although listening to auditions can be time-consuming, I’m looking forward to hearing different voices interpret the short audition scripts I’ve provided. Personally, I’m making a conscious effort to try out several fiction audiobooks these days, trying to get into the spirit of it and learning to be a better judge of what I like in a narrator and why. •	You can download one free audiobook with a trial membership with Audible. Why not test-drive one of mine? •	Often you can buy audiobooks for a greatly reduced price along with the Kindle e-book. So… do you enjoy fiction via audio? If so, name one title that stood out to you as exceptionally well done. If not, let me know what is holding you back, and if you’re open to giving one a try. I’ll give away an audiobook to two commenters. If you’re a winner, you can choose any one of my titles in audio. Winners will be posted in the Sunday Edition on July 31 and can email me with their choice. 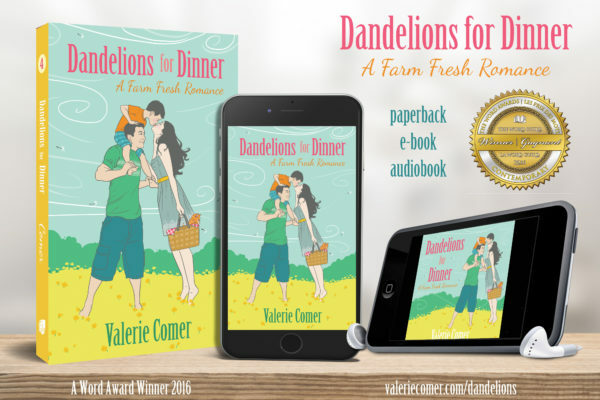 Here’s a sample from Dandelions for Dinner, the fourth book in my Farm Fresh Romance series. 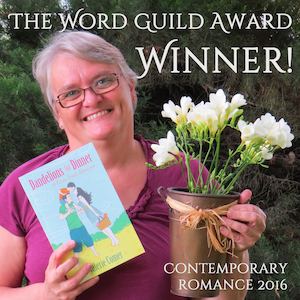 Dandelions for Dinner recently won a Word Award for best contemporary novel from a Canadian Christian author via The Word Guild. You can purchase the e-book from Amazon for $4.99 and add the audio version for only $1.99. That’s a savings of $12.97 from Audible’s price for just the audiobook! Several Inspy Romance authors have their books in audio. You can find a list on the News page. I agree, Val, the narrator does make a big difference. In the past, I’ve stopped listening when I didn’t care for how they sounded. During my commute, I typically listen to sermons. For whatever reason, my mind wanders when I play an audiobook. Congratulations on your partnership with Becky! Thanks, Jill! The narrator is absolutely vital. I agree. Interesting that you prefer quiet. I do, too, so it’s been a challenge to put myself in listeners’ shoes! Thanks for summarizing your responses about the audio question. As a reader, I enjoy learning about an author’s writing, publishing (both print and electronic), translation, and narration process. Even though I prefer to read, I have used audio books in the classroom and agree the narrator is important. Best wishes an the auditions. Thanks, Renate! It was fun to see so many responses! I’m not an audiobook fan anymore, but I was when I commuted an hour each way to work. The narrator absolutely makes a difference though. I’m still torn about my own books on audio. I have one series that is. And I keep thinking I ought to look into doing the next but…time! Maybe this will push me to think more seriously about it. My son uses audible books when he makes a long drive to visit us. His last drive, he didn’t enjoy the book as well and didn’t enjoy the drive as well. I started an audible book but haven’t finished yet, I’m not even sure why. Hope your auditions go well! One of the keys to listening to audiobooks seems to be to pair it with a semi-mindless activity. For me, that’s walking. It’s a matter of switching to novels rather than podcasts for me! But the narrator does have to keep you engaged. Without that… nada. I’ve tried audiobooks in the past and although it is really nice to be read to, I don’t really feel comfortable not setting the pace, not being able to re-read at any point, and I find it is easier to get distracted when you’re listening to someone read for you then reading yourself. I think it would be great for driving long distances, but I’m pretty sure the distraction would not be advisable (lots of attention research advise against that–you’re more prone to accidents). That being said, I did not know I could purchase, download, and listen to audiobooks without an Audible membership. I’ve won a freebie once (I wanted to give audiobooks a try again) that I never claimed because the first step in Amazon was to acquire a membership (I might look into this again now that you’ve mentioned). Also not someone I’d invest in if I’m not sure it would be worth the cost. About the level of distraction while driving – it might depend on the story? It sounds from those I questioned that listening to an audiobook helped keep them focused when they’re driving alone. But yes! You need an Amazon account but not (necessarily) an Audible account. You can also buy audiobooks from iTunes. It’s nice to have options! Actually it has to do with how much you actually imagine the story and become engaged in it. Some research shows the same results while listening to your favorite sports game on the radio. Interesting. You’re telling me that effectively listening to audiobooks means honing specific skills. I need to mull that over! We’ve used audio books on the long drive to visit my family or when my husband travels for work. What a difference a good narrator makes! I hope the process goes smoothly for you. Thanks! So far the voices who’ve auditioned are very different from one another, and I haven’t heard one that ‘clicked’ with me yet. A lovely British voice doesn’t fit with Spokane, Washington! My husband loves audiobooks. Yours above is the first I’ve ever listened to one. Voices are huge for me, so I would have to agree that would make a big difference on whether I enjoy an audio book or not. There have been times I’ve wanted to listen rather than read because my eyes are tired, but I am a visual person and tend to drift off when only listening. I guess that’s the beauty of Amazon’s whispersync technology. You can read then listen then read without losing your place. I was on a road trip for my job and decided to listen to A Walk to Remember. This was my first audio book and I loved how it was narrated. I got so into the story I even cried most of the way home because it was that good. But overall, I do prefer to read. I was interested to hear how many respondents to my question on Facebook said they preferred or only ‘read’ audiobooks! I’d say crying while listening and driving would definitely fall into the distraction problem for a driver, though! Is that the Nicholas Sparks book? Yes, it was Nicholas sparks. 😊. I haven’t listen to another audio book while driving since that experience. I am open to other books though. Yes, you’d want to be careful about duplicating that experience! I was so excited to learn that you have audio books! I love it when I find another author who writes clean stories and who also chooses a good reader, I love Becky Doughty! I actually listen to audio books alot. I listen while I exercise, clean the house and whenever we take road trips. I also listen to them on occasion in the middle of the night when I can’t sleep! I agree that a good reader can make or break an audio book! It makes me sad when I am anticipating a new story that looks like it’s going to be really good one, only to discover the reader is not. It surprises me that an author isn’t more careful! A couple of my favorite audio books are “Just one Thing” by Holly Jacobs, “To Win Her Favor” by Tamera Alexander and “Royal Chase” by Sariah Wilson. Oh, and all of Becky Wade’s stories and all of Tamara Leigh’s Medieval stories! Hi Lori! Thanks for sharing your love of audiobooks! I’ll look into those. The one I just finished was This Quiet Sky by Joanne Bischof, narrated by Gail Shalan. At first I wasn’t sure I’d like it, but the narrator’s wispy southern voice turned out to be a really good fit for the first person young adult story. Part of the problem finding a good narrator, at least for indie authors, is that we have to chose from those who audition. Most of us don’t have the $$ behind us that a publishing house does. I don’t like audio books, one I can read the book a lot faster than listen to it and two I can see the story better in my mind when I read. This has always been my mindset, too! I’m trying really hard to see (hear, lol) the other side of the equation now, though. Oh, I bet A Wrinkle in Time would be a great audiobook! What a cool story. I haven’t read that in a long time. Yes I do enjoy audiobooks! Becky Doughty is one of my fav.. narrators! She’s also wonderful to work with! I’m nervous about striking up an agreement with a stranger! I love Audible. I get many more books “read” a year because I can pop on my earphones when exercising or doing chores. As for the narrator–I still remember my first audiobook, Mercy by Julie Garwood, read by my favorite Broadway actor Terrence Mann. Had I been reading the book, I think I would have figured out the “Big Twist” right away, but because Terry’s narration skills were so strong, the surprise hit me at exactly the right time. I’m still amazed when I listen to that one. I get easily distracted so audio does not work for me. I find my mind wandering so I miss a lot of the story. I’m totally visual. I thought I’d be that way too, but I surprised myself this past week when I gave an audio novel a try. Still, I don’t think listening to audiobooks is going to take over from reading e-books for me anytime soon! Spoonful of sugar. I like that! I like audiobooks, especially in the car. At home I sometimes enjoy reading along. I guess I don’t travel enough, at least by myself. Hmm. Maybe I should change that! The narrator can make or break an average book. I always enjoyed Dee Hendersons narrators. But there have been a few authors that I enjoy whose audio books have been hard to listen to because of the narrators. The range of voices who’ve auditioned for me has been wide! I am in the “No” camp. I’m just not an auditory person. I do much better reading it myself. Plus, I read faster than most narrators speak and I just get frustrated because I’m ready to be further along in the book. I also can’t get past the voice acting a lot of the time. Out of the audio books I’ve tried to listen to, I’d rather they just read the story and not do voices for the characters. Maybe the narrators I listened to just were’t very good, but I just didn’t like it. Some really don’t do a terrific job. I’m quaking in my boots listening to auditions for Secrets of Sunbeams right now. What if I pick the wrong narrator and everyone hates listening to her but me??? The pain is real, LOL.